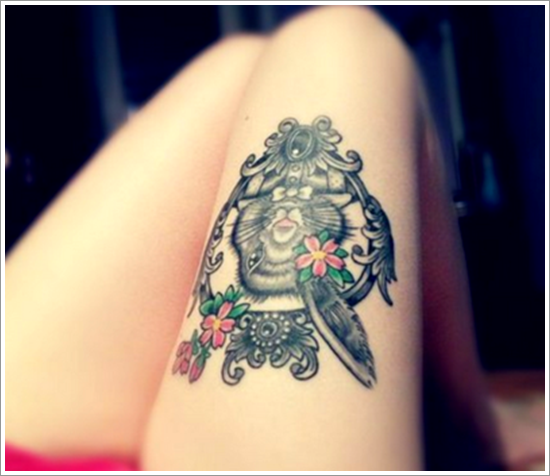 There are numerous factors to consider before you select your thigh tattoo. Take time and close consideration before you select your design. 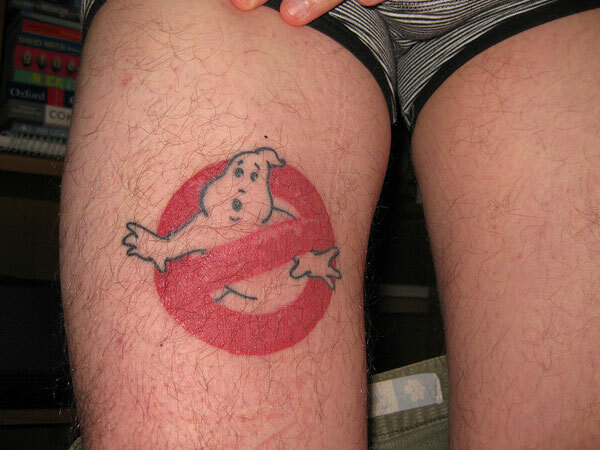 Browse not only through online images of other tattoos, but also consider books you’ve read that made a lasting impression on you, look through magazines, art books, and any other type of media with a discerning eye to seek out an idea that you’ll be comfortable with wearing on your body for the rest of your life – because remember: you can always try and remove a tattoo, but it will never fully be erased back to the state your thigh was in pre-tattoo. Also, take time to find an artist that has a great reputation, and that you can trust to create something unique that you won’t find anyone else sporting. A good artist can look at anything you might bring them for reference material and spin it into something that only you will have. 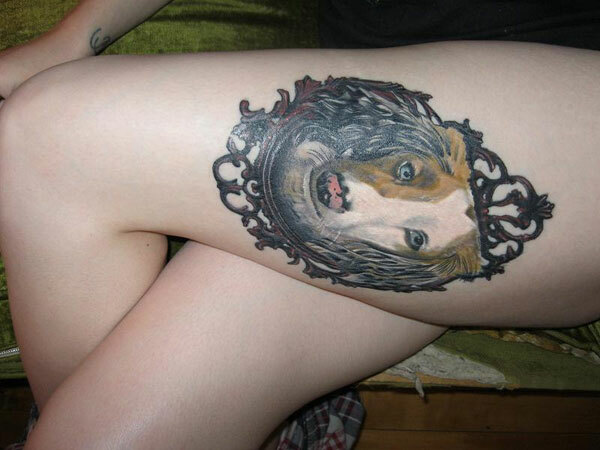 Spend time in the tattoo shop looking at the artist’s portfolio to get an idea of their style and ability, and often you can find ratings by past clientele online when you search for the tattoo parlor where they work. Think about the pain factor. 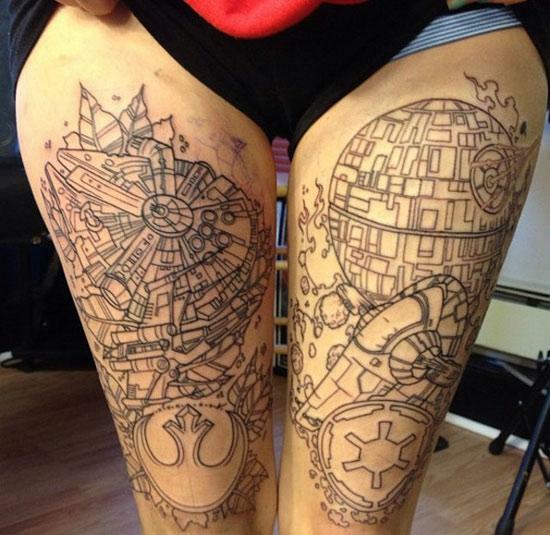 Thigh tattoos tend to be larger so as to cover the entire area from left to right – also larger tattoos allow for more complex designs that will stand the test of time. 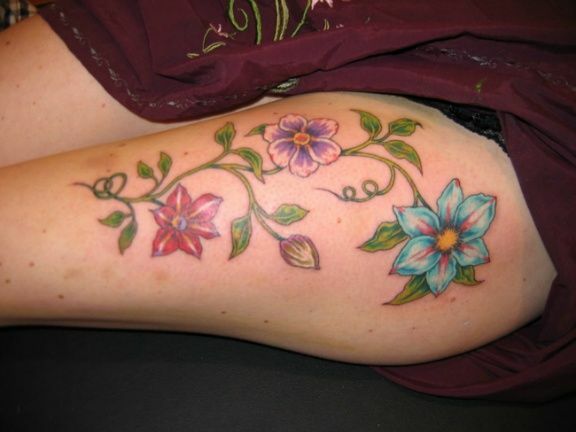 Fine lines and small detail tends to blur over the years, so your artist will suggest that you go larger if your tattoo has these qualities. 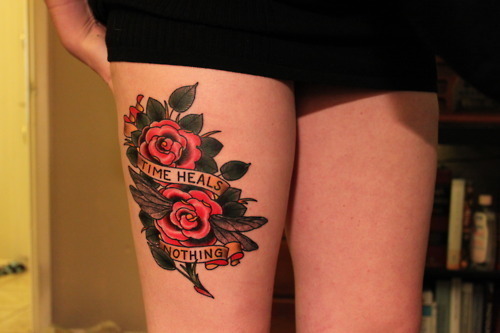 The thigh is not the most delicate place to get a tattoo, but if it continues up to the hipbone area, for example, this area is significantly more painful to endure, particularly over a number of hours. Consider the cost. 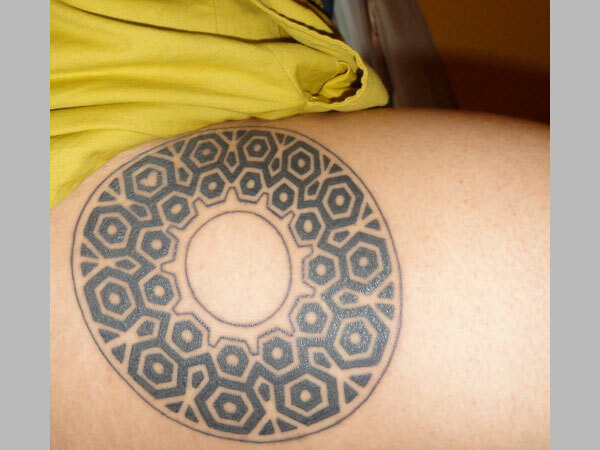 Because larger tattoos can take hours to complete, sometimes people aren’t able to afford the entire design right away and wind up with only the outline of their tattoo for months! 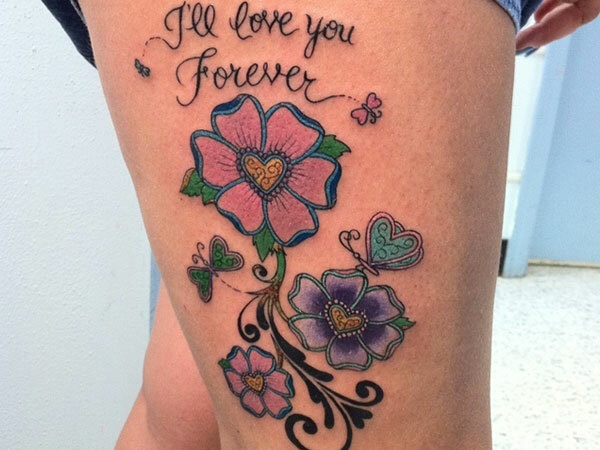 You don’t want that to happen to you, so get a general quote and save up so that you can get your tattoo completed as soon as possible. 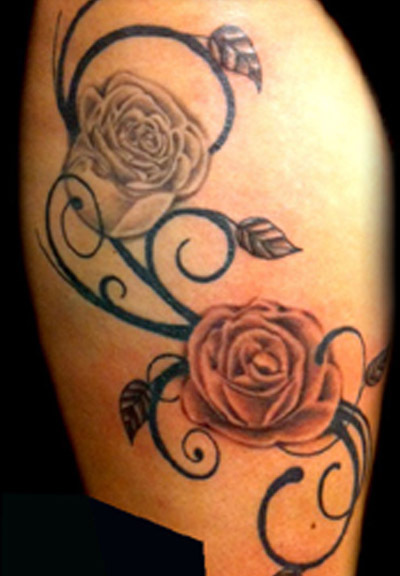 Floral Design – Cherry blossoms, roses, and lotuses have the shape, color and beauty to really catch some attention. 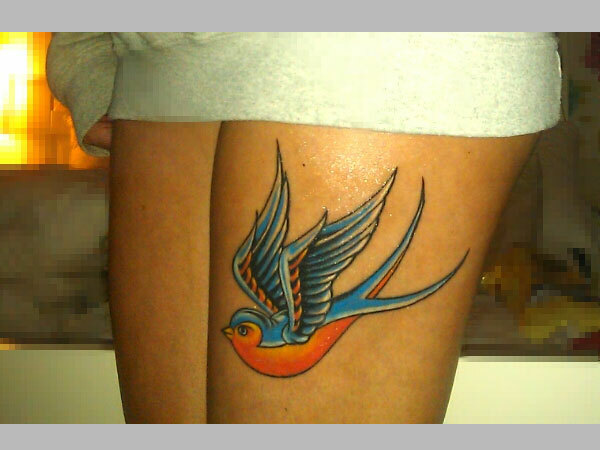 Birds – This is a great choice, as bird tattoos look great as a part of a larger design that looks great on a thigh. Cameo – This is a beautifully feminine option, and the art that surrounds the woman in the middle has room to be eloquent and detailed on the thigh. 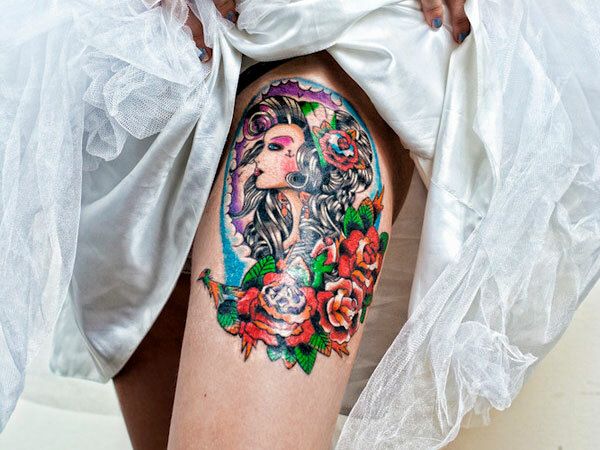 Snake or Dragon – These are great classical tattoos to sport on any part of the body, but if you begin this tattoo on the thigh, you can choose to wrap the body of the reptile as far as you like down the leg – which can look amazing if you get the right artist. 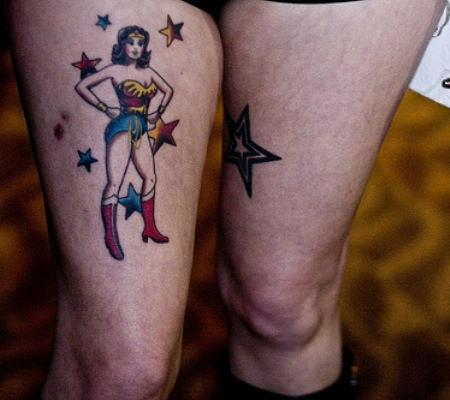 Realistic – Some women opt to get tattoos that look real, such as the lace on top of thigh-highs, ties on the backs of their thighs, or a simple line going up the back of their leg to make it look as though they’re wearing stockings. Find an artist with a steady hand! 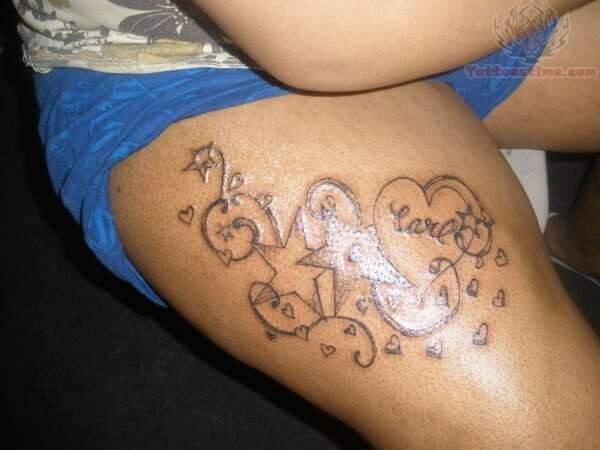 Themed – As previously mentioned, larger, more complex designs work great on the thigh. Some popular themes might include: pirate, Hispanic Day of the Dead, Maritime/Nautical, Skull, hobbies (some might include sewing, knitting, hairstyling, photography), Native American, or any other theme that tickles your fancy! Warrior – Samurais, Braves, or badass men and women throughout history always make interesting tattoo designs. 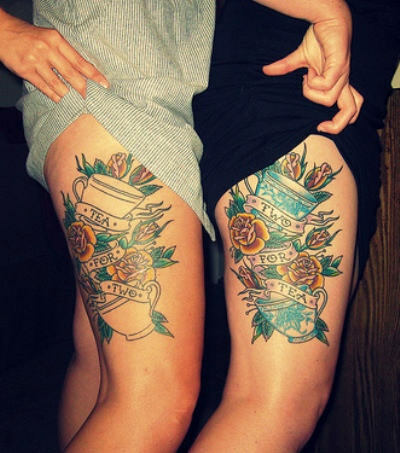 Graffiti – These tattoos can be extremely colorful and definitely get attention!